Some photos of me doing what I do best. Shopping. While wearing what I wear best, a lazy sweater, shorts, and trainers for maximum comfort and ultimate mall coverage! Kidding aside, if I could choose a daily uniform, it would definitely fall under the lines of this. There is nothing I enjoy wearing more than an oversized cozy jumper. Since my black studded sweater from UnaRosa already makes quite a statement on its own, there isn't really much room for accessories. That's when these simple gold earrings from Karat World are perfect to put on. They add just the right amount of shine to my face. I love how flat it is that it almost looks like a sticker stuck to my earlobe. And when wearing monochrome outfits like these, it's nice to add a little pop of color/print with your "non-bling" accessories like my new favorite burgundy bowler hat from SM Accessories and my new lime green Veloci watch from L Time Studio. I love the bright contrast between the two. I was immediately smitten by the sleek, no nonsense design of Veloci Watches. 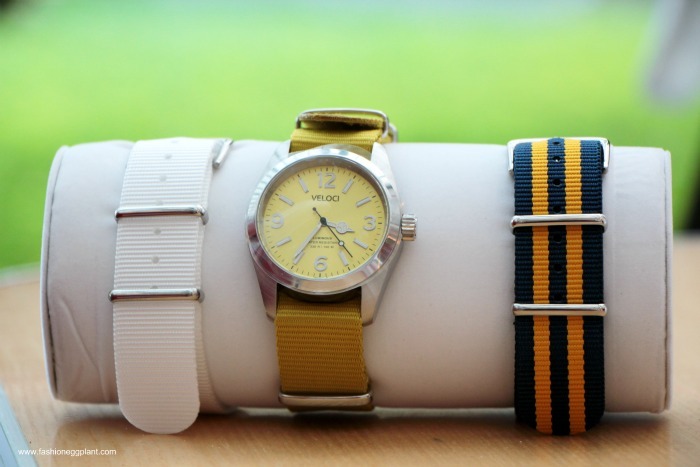 The fact that they come with three interchangeable straps and a very reasonable price tag makes them all the more difficult to resist. They're so much fun to wear and mix and match with my outfits. yay for the sneakers :) Sobrang comfy ng outfit mo Sarah :) sarap mag shopping buong araw!